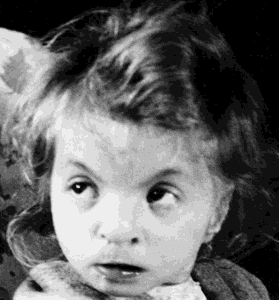 a syndrome associated with partial deletion of the short arm of chromosome 4, characterized by an undersized head, increased distance between the eyes, epicanthus, cleft palate, a small receding mandible, low-set ears that are simplified in form, undescended testes, and hypospadias. Facial view of a 3-year-old child with the Wolf-Hirschhorn syndrome. From Mueller and Young, 2001. A relatively rare disorder caused by a deletion of the short arm of chromosome 4, which results in the absence of a fibroblast growth factor receptor. Its clinical hallmarks include abnormal facial development, delays in attaining neurological and behavioral milestones, mental retardation, short stature, and heart defects. Affected children often succumb to the disease in the first years of life.